The place is called the Kafe Antzoki. It was an old theatre, now a venue. Many bands such as the Manic Street Preachers, Mansun, Super Furry Animals , Ocean Colour Scene among others have played there. 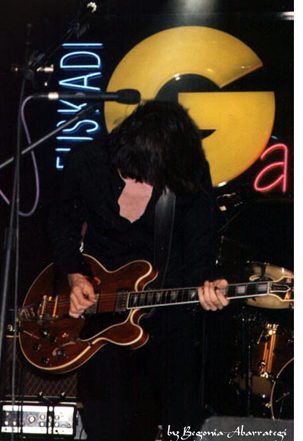 Not one of them blew the place away like Bernard Butler did on 2nd of December 1999. It was a cold day in Boilbao and we all hoped that Bernard would make it warmer. The opening band was a to remain nameless Basque band that sounded horrible and bored the audience to death. We couldn't wait to see Bernard, and were justly rewarded for our wait at 11:50 PM. The legendary guitarist was elegantly dressed in a cool Miu Miu black shirt and black pants that fit him perfectly. The gorgeous hair, the grace in his walking and his natural and fresh beauty made you wonder if this guy had stepped off of a catwalk. But as soon as he started playing guitar you realized you were in front of the best guitarist of the 90's. He started with "Friends and Lovers", the wonderful and cheerful song from his second album of the same title. Sounding better than ever, he has proved that he's no longer a guitarist who sings but a great singer as well. The band consisted of Primal Scream keyboardist Terry "Superstar" Miles, serious drummer, Mako Sakamoto and easily the most lusty man you've seen in your life, bassplayer Chris Bowers. An eclectic mix of players united to form an top quality band. "I'd Do It Again If I Could" sounded especially upbeat and enthusiastic. "Not Alone" and that great song called "You Must Go On" never sounded better. He wasn't acting like a guitar hero, he IS the guitar hero...Sounding better than ever, he has proved that he's no longer a guitarist who sings but a great singer as well. Bernard changed his guitar often, smiled shyly and moved really well on stage. "You Just Know" and "Change Of Heart" were among the other high points of the evening. The last song of the show was "Autograph." For this number, Bernard came closer to the audience than ever and left us totally speechless with a brilliant guitar solo. I have never ever heard a guitar sound so excellent. I still don't know if it was magic, a mystical experience or simply that I never thought someone could play a guitar like that. He wasn't acting like a guitar hero, he is the guitar hero. His hair all messed up while he was getting mad, even hysterical with that guitar on his hands - it was just wonderful. He then left the stage but soon responded to the cheers and demands for an encore returning with a big smile. He played "My Domain" all alone with an acoustic guitar, showing he's also an accomplished acoustic artist. "Souvenir" with keyboardist Terry Miles followed and he ended the night with the whole band joining in for a wonderful, mysterious and sensual version of "Stay." I'd have to classify this among the best concerts I've ever been to, and I've been to many! The new songs are almost just too good to be true and the older material never sounded better. Hopefully he will be touring the US soon and this is not an advise, this is a warning: You can't miss it! Bernard Butler and his band will blow you away!